Spirit of the Veil. 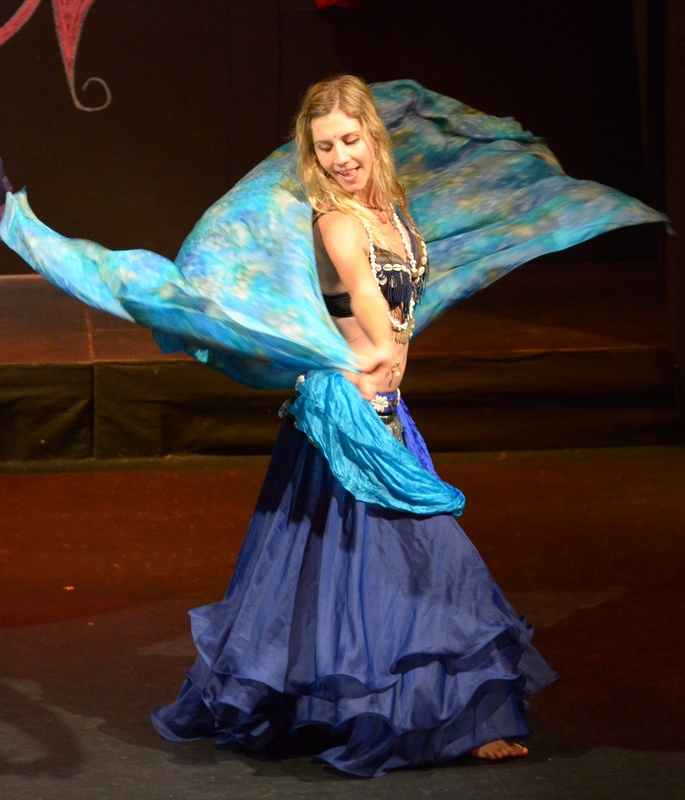 Guest blog by Tamsin Murray about dancing with silk, sufiism and love. The veil is like love. It has as many meanings as there are people to experience it. It is a shimmering silk imbued with very deep, very intense meanings and feelings. It has found its place in the most provocative areas of our psyche, our spirit, our sexuality and our cultures. We see it on women’s faces, wrapped around women’s bodies, portrayed as the symbol of what lies between ourselves and the reality of existence and God. It shields the provocative symbiosis of spiritual ecstasy and sensuality feared and yearned for. It is the thin sheath that we cannot see through unless we relinquish judgement and control. As the protection of saints, the plaything of seductresses it has been given the role of agitating the boundaries of our familiar realities with the suggestion that there is more to life than what we see and reason. What leads us to relinquish control, to set foot off the familiar paths is a force inside everyone. To dance with the veil liberates this force playfully and gives to us a companion and what is unknown becomes known. It is a kind of untouched mine of precious experience. There is a story of Moses having to cover his face with a veil after he had talked with God since his face was so illumined that he feared it would scare his people. There are the myths of Innana and Ishtar, of Babylon and Sumeria, whose descent into the underworld, after their lover, requires them vanquish a layer of cloth at each one of the seven gates. Oscar Wilde made famous Salome whose dance of the seven veils brought her the head of John the Baptist. This crossing into different worlds, ecstacy and the sacrifice of reason has made the veil a beautiful evocation of our inherent need for experience and connection beyond the ordinary. Not long ago the veil was seen as a mere embellishment to the performance and dancers would usually twirl a few times with the veil then discard it but more and more dancers are discovering the veil to be an instrument in itself capable of an infinite number of subtle and sophisticated motions, that create a magical illusion of worlds opening into worlds. This transformation of the perception of the veil is gradually pushing out the limitations set upon dance by choreography and alongside of Middle Eastern dance opening the art to movement that interprets the moment. Historically our culture has forbidden such freedom of motion in its pursuit to mould the art into a ruthless process of selection and form so that it could fashion values and distinguish itself from the dance forms enjoyed by the lower classes and countries seen as backward and savage. In the early 1900s, with the appearance of dancers like Isadore Duncan and the exotic dancers of the Middle East in France, glimpses of a freedom of expression lured and ignited the hearts of many and opened the way for much more interpretive forms of dance that now continue to blossom into a cornucopia of fusions. The Middle East is showing us a form of dance free of the choreographer’s control, a dance more grounded in the strength and spirit of creative passion that derives its form from the natural communication between music, the soul and the body. When I have watched choreography I am often bewitched by its prettiness, in awe that they can memorize the steps but it often does not go beyond novelty unless there is a rich deep soul igniting the movement with the force of presence and personality. The marriage of practice, knowledge and spirit, depth and creative passion makes the dance become something so uplifting to the spirit within the audience. It becomes the transformative vehicle for the soul to grow and not just entertainment. Dancing for the love of life alone. Original photo by Tammy Mills-Thom. Editing Jade. Within Middle Eastern dance in the West, the opportunity to explore and express an inner knowledge is tempered by a fascination with the glamour and beauty of the costumes, the ego and competition surrounding dance, the use of choreography to be the goal and purpose of learning the movements and the timidity of displaying such a sensual form for lack of experience in expressing it comfortably in a public space. So many experiences of shame with expressing this vitality and yet to see a dancer comfortable and joyful in her expression of her life force is one of the most beautiful visions. These veils of choreography, of costume, of timidity, of competition, the egos are like the veils of Ishtar as she descends into the underworld to release her lover, for ultimately in all people the love inside themselves yearns to be released before they can play with the veils of existence with ease . In mastering these veils the dancer goes within, to their body, their own expression and begins through practice and dedication to unveil their unique physical language, their own interpretation of how the music moves them. In all forms the essence is the surrender to the moment as the music inspires all manner of motion in the limbs and their corresponding emotion. The veil itself is a symbol of all these inner forces playing hide and seek within the dance and can embody each veil of the soul as it moves. When I see people dancing with the veil, both men and women, it is if I am watching what they allow themselves, what they struggle with, where their inward limitations lie, how much they are willing to let go, how they view their connection with their inner selves, how comfortable they are. I always say yes to the veil, and follow it into a journey across into the time of love, to innocence and wonder, where happiness is easy. I see others with their veils find the opening and they come and together we discover that the lightness of the silk and the air, the light and the music have become smiles and laughter and healthy breathing and bliss in motion. In each individual’s hands it becomes an extension of the way they move, the way they relate to the world, whether it be like an explorer, a romantic, a performer or an artist. It brings their qualities into play with something that mirrors them. It is all expressed beyond the level of words and yet tells so much. In much of the same way that they explain the beginnings of life in the universe, the dance with the veil is this endless converging of formless energies giving birth to new languages that by the intensity of feeling provoked are suddenly brought to form and become an edifying signature of the dancer’s personality. become the source of many experiences of very deep and profound states of feeling and connection. At first dancing with the veil was a struggle to keep it graceful, let alone synchronize the finer shades of feeling with the music, look out from the corner of your eye to see how everyone else was doing and judge the beauty or lack of, my veil dance. I danced as if emotion was outside of me, learned from something I had seen and was trying to imitate. Many people would continue dancing with the veil and look completely absorbed. As my capacity to concentrate grew from doing the Sufi work, the relationship with the veil changed. Emotion found a way to focus and create for itself new expression and each time we danced with the veil more discoveries arose. Seeing others dance with the veil, though they were not dancers, taught me new ways to play with the veil. It was the innocence and individuality that found unique moves and feelings. Dancing with the veil feels beyond dance in a way because concentration on the veil becomes like an ecstasy. I follow the veil’s dance and my body becomes an extension of it and it becomes an extension of me. It gives other life to my being. It talks to me. It tells me the depth of what I am experiencing. 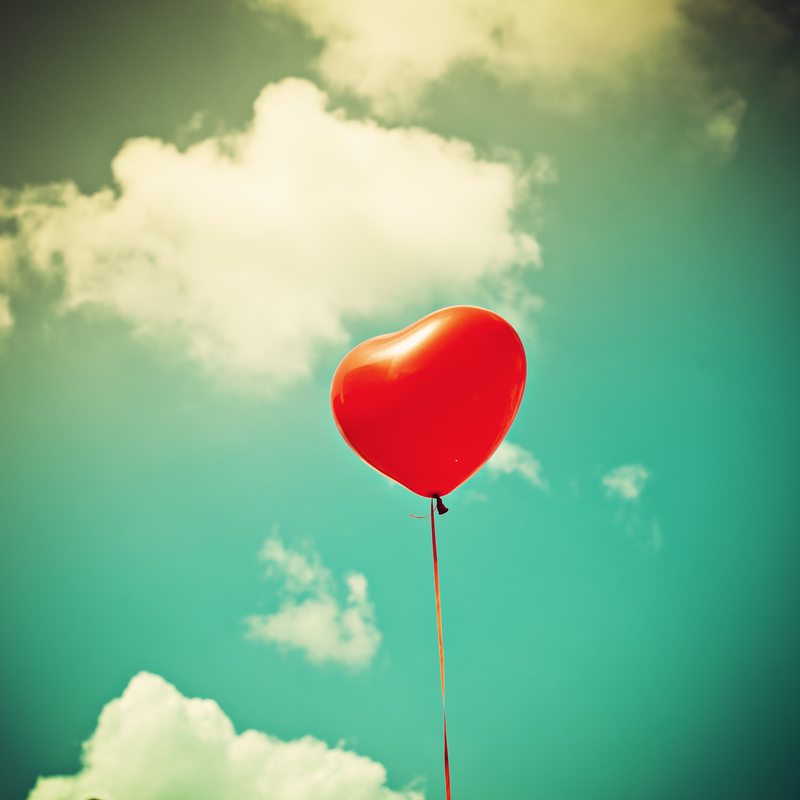 It holds me beyond any form of suffering I might experience and gives my expression to creating a state of love. It sometimes even illicit such ecstasy that I don’t remember where I am or who I am. As I respect the veil more and respond with an intent to feel it’s moods so to does it give back to me a reflection potent with revelation that I may follow, and I don’t know where it will take me but it has given life already to the most hidden regions in my heart. It has softened the most irreverent creatures in my soul. It has offered it’s form to give expression to feelings I could never have spoken of so eloquently. 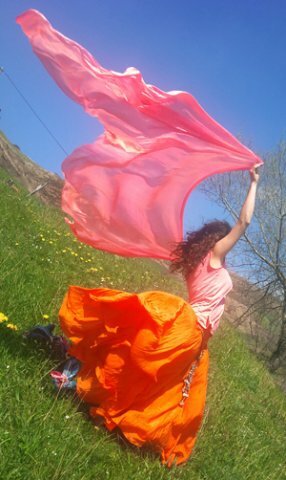 The veil began to show how much developing the spirit through chanting, whirling and slow movement opened my body and heart to a creative and very sensitive force that made dancing with the veil like an exploration of a newly discovered part of the soul. The veil work became a way to connect with the sanctuary of concentration . It is like an elevator lifting up beyond outward concerns, beyond emotion, beyond self and within that sanctuary the concentration opens more to show subtler levels of focus and how the tiniest disturbance of thought could break the flow between my body, the veil and the music. Without the veil I don’t think I could have ever reached this level of focus in front of an audience because the veil quieted the little monsters of self consciousness and allowed me to move beyond them. For many dancers the self consciousness distracts and pulls them away from the simple joy of dancing. 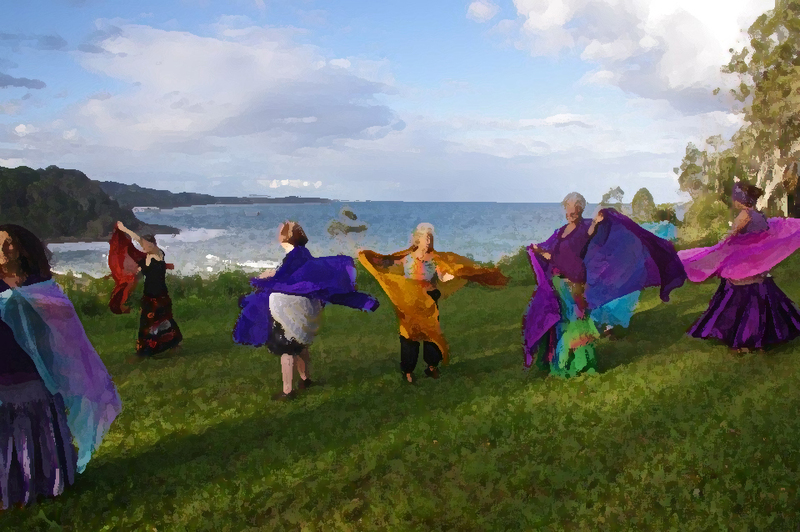 Dancing with the veil often sets people free from those initial doubts and let them have fun and be able to reach out past the shyness and discomfort and just move. It seems to take the edge of seriousness away and makes adults play. freedom, mystical union, contacting the beloved come to life within the dance, where I have encountered the ego exercising its obscene influence over the body, the limbs and the emotions as it stands stubbornly in the way of the ecstatic union in the moment, where the challenge of being so completely present fills the whole being with the euphoric contentment of living in the moment. The work is a powerful call on a cellular level and within each workshop or exercise there comes a feeling as if each cell in the body is singing in unison, creating a wholeness from the thousand s of elements and functions that allow us to exist. It is like an audience spellbound by the singer or the dancer, it is satisfied, focused and in harmony. When I saw the Om Kalthum documentary “ A Voice like Egypt” and how the audience and her responded to each other that is how the sufi work affected my being, like the heart was Om Kalthum, the body was the audience and the voice was like the spirit bathing everything in a warm, shared ecstasy. Sitting in the workshop feeling this is often accompanied by the sound of Abdel Wahab’s music Cleopatra slowly rising in volume and letting me know that Adnan is about to invite people to dance with the veil. It is here that he sometimes asks me to dance with the veil and let the group watch to see what can be done with it. Even though sometimes it feels as if I cannot move from the state the work has put me in I have enough experience now to know that something will ignite inside and lead me in to being able to dance. Cleopatra is a slow but deeply powerful tune and always gives me the images of spring and of bounding happily through the new growth of forests with the wind and sun dancing across our bodies. The tempo holds me and makes me remember to breath and center and not rush and then it happens. The energy released from the previous exercises seems to possess the veil. It comes to life and I begin to watch it and move as if it is a partner to me. I begin to extend into movements I have never done before and where once I would have cut off a move before its completion I feel it extend outward to the very end of itself, articulated into the very last inch of my fingers within the rhythm as if time is expanding. The fullness of the emotion inside the dance ripples out into very subtle details or through very rhythmical repetitions, but always it is as if I am witnessing, as if a force inside, buried once by shyness or shame or inadequate strength, is set free and with the spirit expresses itself without any interference from my ego. Often Adnan will begin to play the tambourine and the rhythms shift to beats and the sound of the jingles penetrate the space and the dance becomes a testing of how much I can keep with the constant shifting of rhythms that Adnan is such a master of. The focus becomes so deep that a few times in concerts on high stages I have been able to spin and dance on the edge without fearing that I would ever fall because in the abandonment to the movement comes a complete attention. Sometimes the veil is like fire, sometimes like water, or storms or the calm of a soft breeze or the deep inhalation of an ocean, sometimes like a pause in time. The unfolding of possibilities in motion with the veil is endless like the seas. I peer into the folds as it floats above me and I haven’t the capacity to perceive it’s ending. If the world about me is too noisy with drama it’s door opens into a quiet and very gentle rapore that savors the quiet beating of the heart, the breath and the moments, when the silk floats and becomes the lilt of a soft voice that is singing the secrets of a living eternity existent always inside the moment. Songs of a love between humanity and creation, that blooms like a rose at the calling of day, like light moving into cold shadows, like the ebb and flow of the ocean and the moon. Tess – The water dance. Photo by Bruce Thomas. Sometimes the energy of the group in the workshop comes to life in the veil as a shimmering sensitive vision of new perceptions. 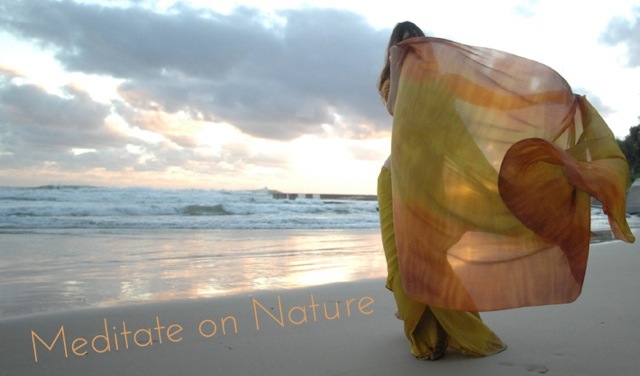 In whatever form the lightness and color of the silk has reflected the beautiful emerging of new energies within the being, within the atmosphere of the group as it is lifted into new feelings by the simple methods of sound, movement and breath. When the group is in a deep state the dance with the veil seems always to rise to higher, subtler levels and Adnan’s drumming keeps this openness continuing to expand without word, without the limit of time, without interference. when I could dance completely without my inner demons teasing and taunting but when I see dancers whose ease of motion is like beautiful poetry and their egos seem absent from their dance I am inspired and feel to watch them is a gift to the soul as well as a gift to the dance. The dance becomes like life. the more comfortable you are in it the more it responds to you like a friend. The veil allows the dance to evolve. It gives you a lovely silky substance of color to yield to as the body responds without judgement to it. Time and space, color, movement, emotion, concentration, sensuality and music become friends. Often a beginner looks as if they are dancing on their own as if they are alone but a more experienced dancer seems to invite all kinds of energies conjuring them as they move making them alive for others to see. Dancing with the veil is a very simple way of conveying the feeling that you are not alone, that the space, the time and the light of the moment enters the veil and shows you that you are connected with them. Want to read more ??? Tamsin has published a book called “Inside the time” about her experiences travelling with Sufi master Adnan Sarhan. You can purchase the book and a stunning array of silk items from her website.